Laughing Clowns have long been the ‘must have’ activity for any fair, carnival or agricultural show in Australia. Prizetech has taken this Aussie Icon and developed it into the most awesome trade promotion. Our Laughing Clowns are regular full size laughing clowns – just as you’ll enjoy at the local fair. However we’ve enhanced the motor and electronics by adding a tablet computer to manage the clown, this feeds real-time data to Prizetech so our technical gurus have all the details of your promotion (transmitted by wireless). The picture below is one of our clowns enjoying a well-deserved rest. Your contestants insert five balls into the moving clowns mouth trying to get all balls in the ‘winning’ column. If they do – they win big – Prizetech pays. You can award minor prizes or product etc. if you want to for those that don’t win the main prize. You can be really creative with an insured Laughing Clowns promotion, you can offer prizes of a car, a holiday, a big cash prize. You could offer sporting equipment (like golf clubs) or a high value shopping voucher – maybe a combination of these. We all grew up with laughing clowns at fairs so they appeal to a wide cross-section of Australians and to people of all ages. Beyond the sentimental appeal is the simplicity; everyone know how to play and everyone can have a turn (some promotions only allow one or a few contestants to enter). 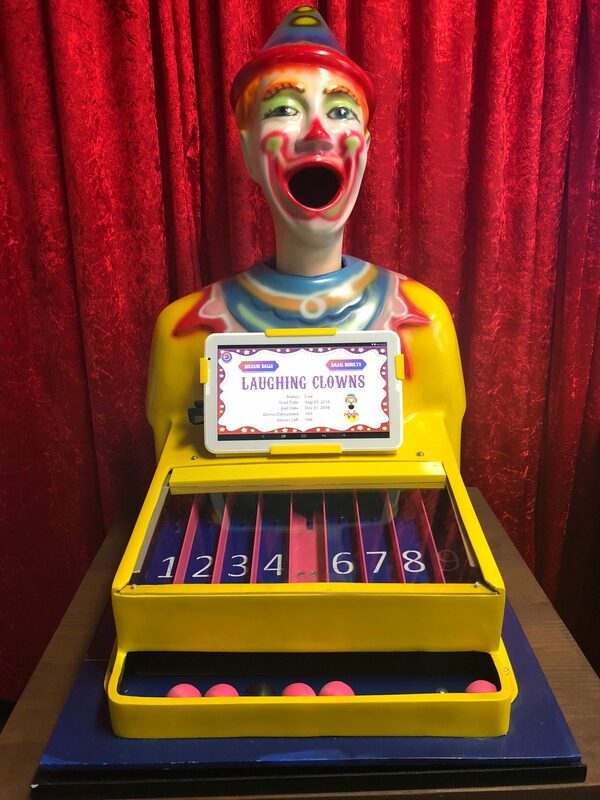 You can usually get 30 – 40 contestants an hour having a turn on a laughing clown (and you can have more than one clown at your promotion or trade show). The Laughing Clown is 54 centimetres across the front and 70 centimetres deep; an ideal size for trade shows. Where it’s to be free standing we have an optional stand available for hire. You’ll need to have one staff member or promotional person to operate each Laughing Clown. We’re busily building more Laughing Clowns so have a very limited number initially, therefore you really should book your insured Laughing Clown promotions as early as possible to avoid disappointment.